Serve your signature sauces with ease using this 2.5 oz. stainless steel round sauce cup. Whether it's ketchup accompanying french fries, dressing on the side of a salad, or your signature sauce to add to a sandwich, sauces are an integral part of a meal. This sauce cup provides a simple, cost-effective way to serve these necessary condiments to your guests and is a great alternative to wasting disposable products. Use this round sauce cup in your casual restaurant, diner, or bar by pairing it with a matching fry cup for a simple, classic presentation. This product is amazing. So easy to clean they make serving dipping sauces so easy. Can also be used as shot glasses when you run out. this cup is a great cup for holding a number of sauces. the material makes it easy to clean and super convenient to use. Highly recommend as a pairing for any dish that would want dipping. A great cup to be used for dipping sauces, measured ingredients, or even a quick shot glass. They are easy to clean and neatly stack away taking up minimal space. Not just for individual portions of ketchup, mayo, or whatever... These little guys are great for mise en place with small stuff like spices or salt. I love using these for all types of sauces & condiments. From mustard, to ketchup to mayo to aiolis these are perfect ounces for guests. This little sauce cup is a great value and still looks like a quality ramekin. Holds up nicely in a commercial dish washing machine. Will purchase again. These stainless steel round sauce cups work perfect for any type of sauces. They are very durable and will last a long time. I highly recommend this item. Couldn't live without my 2.5 oz Stainless Steel Round Sauce Cups. I use them to pre-portion ingredients before preparing a test recipe. They have been used and washed 100's of times and still look like new. I love all the sizes offered in these sauce cups. They are such nice quality and so very attractive. I use them for food prep and serving side of condiments or sauces. They clean up easily. The price cannot be beat anywhere. I highly recommend this product. A product that does what it is supposed to do and it looks good! The size is perfect for serving sauces. Is the cheapest in its category! Worth the price. I recommend it. Great and storng quality stainless steel, looks really great with dressings and sauces and its the perfect size for small orders, perfect for sea food you should get it!! This stainless steel cup was the perfect size I have been looking for sometime. Our ceramic cup keeps breaking or chipping, this help from replacement. A great size for sauces. We use ours for dippers and they fit the bill perfectly. The design is stylish and sleek - exactly what we were looking for. 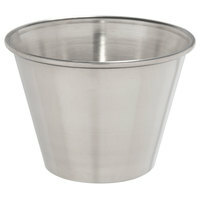 These stainless steel round sauce cups are great for holding sauces, syrups, butters, etc. They look stylish on a metal plate, too. perfect for our decor. Also bought a smaller size of this cups, really good portions cups, you can keep reusing it, looks professional and clean, this cups is durable! I love these sauce cups as a way to save money. They are super easy to wash and you can't damage them almost at all! These little stainless steel cups are great when you don't want to use plastic soufflé cups. They work great holding small amounts of dry ingredients when you are baking. Great deal! These sauce cups are a great value. They wash well and are well made. I use them for prepping ingredients for cooking; they're great for holding small amounts needed for your recipe. It saves time having everything ready to be thrown in. These sauce cups come in packs of 12. This is a very basic and simple looking sauce cup. If you are looking to save some money and you are ok with a very basic design this is a good choice. The cups will hold 2.5oz and work great for condiments and other sauces. These are pretty self explanatory, but are very well made and would not buy a different one. Would recommend these to anyone as they are great sauce cups. This two and a half ounce Round Stainless Steel Sauce Cup twelve pack was exactly as I expected. The weight is great for stainless steel but it doesn’t feel too heavy. I have not noticed any sign of wear at the edges as I have experienced with many other brands. This treat is a must have for any kitchen for sure. Very durable and would recommend. stainless steel sauce cups have so so so many uses. i use these for holding spices and ingredients while cooking, sauces & dips, even have put a small amount of m&ms or similar in one for my daughter.. Theyre great for kids because they are all but indestructible so them dropping them wont break them. can't wait to see what else i can use them for! great buy! great price. thumbs up! We have these in other size and have really liked them. They look very sleak and clean on the plate and hold just the right amout of sauce. Its sad how many of these either get thrown out or stolen. So the cheaper you can get them the better. This is a great price! Double dipping is easily prevented with these cups, they are the perfect size & we can also use it with different sauces or ketchup if we needed. This is a great sauce cup for a variety of uses. Perfect for all dipping sauces like ketchups, bbq sauce, or even ranch and bleu cheese dressings! We use these to help portion our sauces for dipping and for dressings in our salads. Easy to clean even in the dishwasher. They are light weight so I suggest putting something over them in the dishwasher so they don't turn over in the cycle. These are a great ramekin substitute. They are very affordable, and they are nearly indestructible. I like these a lot. Also if they accidentally get thrown away no big deal. Love these but wish they made a 2 oz option also. We use this for all our sauces, bbq, ranch, etc. They look great and hold up. No surprise here, these are great at holding sauces! What I like about the stainless steel is it keeps the sauce colder than the clear plastic ones. Great price for what you get. Order lots bc these come in handy for all the sauces for your orders. Does not rust and east to use. Does its purpose sauces, spices, measures whatever you need, this is perfect. We use these for everything at our restaurant - ketchup, salad dressings, butter. They're the perfect size, easy to clean through the dishwasher and store stacked. Would recommend! I used these to put ketchup, mayo, mustard etc! Even pickles and coleslaw... they are the perfect size... not too big and not too small!!! The 2.5 oz. Stainless Steel Round Sauce Cups are great for condiments, perfect for dipping. The quality is very good, especially for the low price. I am very happy with my purchase. These are a great value. These are good for sauces, obviously. Portioning them out during large meals is convenient. But, there are a lot of other things these can be used for. If I'm really trying to get the party to pop off I'll use them as shot glasses (they're much more durable and the 2.5 oz ones are more similar to the sizes you'd see at the bars). I've used them to shape little rice pucks, and they work well for setting up steamers (just throw three down in a shallow puddle of water in a pot and set a plate on top). They're nice, they wash well in the washer too. We ordered 144 of these sauce cups to use for ketchup. Within six weeks they were DESTROYED by the dishwasher- Cracks on the outside and rust everywhere. Although we are a high volume establishment which does cause a lot of cleaning- they still did not survive two months- NOT A GOOD PRODUCT! Longer, slender design than it's small counterpart but still a good product, I guess personally I just prefer the stout, short and round dipping containers, but this one should be used more for backup shot glasses, larger additions or a group sauce dish for a table. I love having these around the house! I have never liked putting sauces or dressings directly on the plate as things get spread around and touch other food, so these are great to have on hand and really up the presentation. Great tool for portion control. We switched to this brand due to price point, and we are very happy with their quality. We'll be ordering more soon! Nice item. Very sturdy. Easy to use, wash and store. Can also be used to keep or warm up hot sauce items on the grill. I use the 2.5 oz. Stainless Steel Sauce Cups primarily as prep bowls for spices, extracts, smaller measures like baking powder/soda, etc. Also great for their intended use as sauce cups for dipping sauces, sides of dressing, and small portion bowls for nuts. The quality is ok by me, no issues so far. This is a good medium size for a sauce cup. I enjoy that it is stainless steel. The price is great. They seem to be very well made. Last forever with beautiful finish good for all side sauces and condiments. very economical alternative for plastic and others choices out there my customers love it. They don't necessarily look high end but they are perfect for condiments to with with burgers and fries or butter for lobster and other seafood. Price cannot be beat. These are sturdy containers we use for marinara sauce and dressings. It's the perfect portion for salad dressings. One for a small salad and two for a large works perfectly. I love these sauce cups! There are 12 in a pack. This is a great buy! My kids are always complaining when their dipping sauce for one food slides into another food. This prevents that from happening. Also it's convenient and is sure to get your guests talking about your kitchen stuff. At this price point I ordered one 12 pack, unsure of the quality since I pay at least twice as much anywhere else. They are as nice as any I've ever bought and am ordering more! I'm very happy with these. I use these sauce cups to help portion out prep ingredients for dinner service. They are so much easier then using several larger bowls. I have not experienced the rust issues others have mentioned, but I do see heat marks from the dishwasher on occasion. These are purely cosmetic however. The price of these is low, so you can buy in bulk without breaking the bank. They are less cheesy than the typical plastic sauce cups, and stack better while taking up less space. I've had some for almost ten years in my restaurant and they haven't dented or rusted- only occasionally "walked away,"
These are a nice size for a single portion of dip. However, we find that they sometimes rust in the dishwasher and therefore require hand washing, which isn't ideal. These stainless sauce cups are a great way to provide sauces and dressing to your customers. They have proven to be durable and long lasting. This is my second time ordering these cups. A great item to have if you're conscious about your food portions! Before we ordered these, we were using way too much ketchup, syrups, salsas, etc! We would not be able to exist without stainless Sauce cups. We use them everywhere for little side of salsa, mayo, dressings. Looks great on the plate. Last forever. They just get lost sometimes. Cheapest I've found these anywhere. The quality is amazing at this price point. The majority of these go into the trash anyway so the cheaper the better. This ramekin is solid, light weight, and pleasing to the eye. Holds a solid amount of product in stable position. We use them in plating applications and in delivering extra or side sauces to guests. i used the cups to arrange my spice box like masala box. it is very help full. and look in cute. and i also used to as measuring cup for my dal. These little sauce cups come in handy for everything. They look sharp with our meals and the customers love them. They clean easy, but watch out, they can get lost in the dishwasher. I didn't think I would enjoy these little stainless steel round sauce cups so well but we really do. It seems like we are always using them for something. Our Kids also like to be served food out of them. they think it is fun! Great Sauce Cups. I have used them for a range of things. Well built and hold a good amount without having to top up every 5 secs. I know this site is geared towards restaurants - I just want to say this has become my new favorite place to shop for home goodies! We love these little cups. We use them for ketchup, bar b q sauce, syrup, ranch...whatever we can dip...LOL. My 4 year old loves them most. This is not food related, but I am going to order a few more sets and make some RAIN CHAINS with them \0/ Thanks WEBSTAURANT..so glad we are friends! Cheap enough but super sturdy -- everyone can have their very own condiment of choice, right with their meal -- so much better than paper or plastic cups -- they are heavy enough that they dont slide or move around when dipping. Absolutely Love these when I'm cooking to get my ingredients ready. Also great for coarse salt. I can't get enough of these in my house. These are great little metal cups, the perfect size for condiments & sauces. We purchased a dozen to test out & will purchase more. Easy to clean, durable, great price & fast shipping as always. the 2.5 0z round sauce cups are made of durable stainless steel and are perfect for condiments, butter and other smaller portioned foods. Amazing price for 12 pack and plan on purchasing more very soon. It might be silly to some to get so excited over a 2.5 oz sauce cup but I am elated I found this web store! I had purchased four 2 oz stainless steel cups like these from a local popular store. I liked them SO MUCH because they are great for placing my various seasonings in and when I cook. I needed more than four so I went back to get more but the item was discontinued. The twelve pack was just what I needed and they are of better quality than those I purchased locally. I LOVE cooking, especially for friends who visit, so any time I find a well made product that makes my prep work a breeze I am a well pleased person. 2.5 oz. Stainless Steel Round Sauce Cup - 12 / Pack are great little portion cups. We use them for shots of flavor for coffee. Really durable stainless steel ramekin. What's great is that you never have to worry about a kid breaking a ramekin on the floor off your restaurant. Really good price! Very nice quality, heavy duty sauce cups. I was worried that these would bend easily and they don't. They are nice enough you could keep for a while but affordable enough that if they were thrown away it wouldn't be a huge loss. This is the perfect size cup for ketchup complimentary to a burger. We also use these for side sauces that the customer requests. It has a sleek style that would rarely not match a restaurant. These are very well made cups. Can be used for numerous things such as sad dressing, sauces, butter, just about anything. Will be purchasing more. These small sauce cups are great for condiments on the side. They are a great size, and look so much nicer than plastic, disposable cups do. I was actually really excited for these to come in. They work great and have had zero issues with these since opening 5 months ago. Perfect for all sauces we use and easy to clean. I like the stainless steel round cup. Very good size. Perfect for syrup or any other condiment. I will definitely buy again. This is a good product. This are much sturdier than I expected. I don't own a restaurant or anything like that, but I like using mine to hold sauces for frozen dinners. I'll cook a big batch of something, separate it into freezer safe containers, and use one of these for whatever sauce I'd like. They hold up very well. Great product, great price. I cannot run out of ideas for these things, sauce cup is just the initial suggestion. LOL. These cups make great little baking forms, molds, and make for a classy presentation. A great addition to a fancy dinner party. Serve individual portions of salad dressings and gravies, why limit it to sauces. O have molded tempered chocolate, mouses, and gelatin in these things. Go for it with confidence. Great ramekin. Good construction, sturdy walls and rims. Wash easily. Look great on our plates with salad dressing. Good price. Definitely recommend. We will buy again. The 2.5 oz. Stainless Steel Round Sauce Cup - 12 / Pack have so many uses. You can serve croutons in them so they are directly on the salads and get soggy. Your guests and or loved ones can determine how much they'd like to use and can pour it on their salad. Works very well. These little cups are great for holding a single serving of sauces. I have also used them in place of ramekins for baking creme brulee. From dipping sauces and condiments, to being used as prep cups. these are great. At 2.5 oz's the are just the right size for many different uses. These are cheaper than the ceramic ones and compliment the plate well. Its a great value for the money and cost effective in the end. The 2.5 ounce stainless steel round sauce cup looks awesome on our seafood towers. When they contain cocktail sauce and placed in the ice, they are kept at a nice cold temperature. We mainly use these for events that have many dipping sauces. They are easy to clean and have many uses around the kitchen outside of their normal uses. Great product, sturdy and almost indestructible. We use these for all condiments and although the up front cost was a little more than glass and ceramic ramekins they pay for themselves since they never break. These cups are perfect for condiments and small snacks. They stack perfectly and are so easy to clean! 12 packs are perfect size for both residential and commercial purchasing. We use these for all of our side sauces, which we have pretty much every entree. Great product and I do not see us changing using these. I love these sauce cups. They are the perfect size for ketchup (or other condiments). They fit nicely on plates, and after you are done eating, I just throw them in the dishwasher. These stainless steel sauce cups are the perfect size for any condiment and look sleek next to any dish. They are easily cleanable in the sink or dishwasher. This comdiment dish is the best price I could find anywhere. Not to mention, it is stainless steel! Have been using them at my restaurant for a couple months now and no rust or stains make this the best buy! I love these 2.5 oz stainless steel sauce cups. they hold au jus, steak sauce, ketchup, salad dressings... all elegantly. They are inexpensive and because they are stainless, they keep their good looks. A nice bullet cup, ideal size for ketchup, mayo, bbq sauce, etc. The inox is always an elegant touch. Also nicer than the plastic ramekins since they stack without taking up as much space. Overall, a good value.